In a dream in 2014, I was taken into the future where I saw the destruction of the United States, orchestrated by Barack Obama. I knew it was well beyond the end of his second term, but he still had a large staff reporting to him and referring to him as President Obama. I saw him departing the United States, leaving a woman in charge of carrying out the final phase of his plan, which was the mass murder of the American people. I was not shown the woman’s name or title, so I don’t know if she becomes President or operates with another title, but I found it interesting back in 1933, William Branham saw a beautiful but cruel woman ruling over the United States. So, I’ve been watching to see if an attractive woman will be running for president in 2020 and it appears the answer is yes. 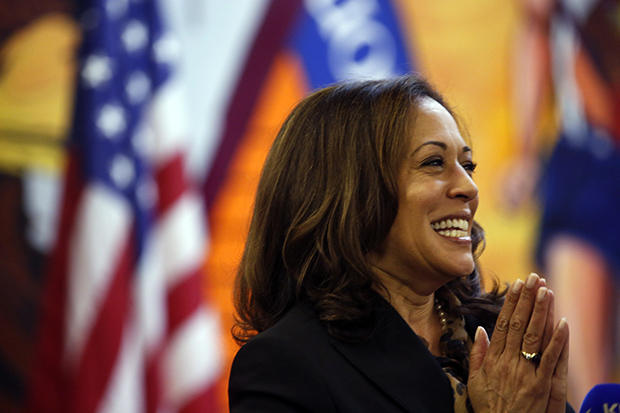 Although it’s still early, California Senator Kamala Harris has become the front runner for the 2020 presidential race among African American leaders. She moved to the top of my watch list recently when I saw a photo of her hugging Obama with him saying, “She’s going to be president one day.” Like Obama, she’s half African American. Sen. Kamala Harris is the potential 2020 Democratic presidential candidate generating the most excitement among the black political elite, according to participants at this year’s Congressional Black Caucus Foundation policy forum in Washington. “You’re hearing Kamala, and Cory’s a distant second,” James Williams, director of federal relations for Wayne State University and a former longtime congressional aide, said, referring to Sen. Cory Booker, D-N.J. It was sad to see such a large percentage of African Americans strongly supporting Barack Obama’s presidency from beginning to end, including many church leaders, but it’s even sadder to see them providing the launching pad for another evil president who might be the woman I saw overseeing the mass murder of millions of American citizens. Great job with that S. Peter. The meanings of her name confirm she could be the woman William Branham and I both saw. What’s interesting is yesterday morning (before you posted this article), my wife sends me a txt message saying I think this woman is the one James saw in his dreams. Then a couple of ours later, I saw this article online. In all these years, I don’t even recall any other time she’s talked about a z3 related article so I found it interesting. Thanks for the confirmation Jemba. One thing about William Branham’s prophecy is the “beautiful” part was never part of his prophecy. It was added later on not by him to embellish it. Kamala means “terrible” in the Finnish language. Interesting that her dad’s name is Donald and she’s from Oakland who has a football player on their team who’s nickname is “Beastmode”. Don’t discount Hill’s daughter running, there are some saying what happened in Israel is a guide map to what will happen in the US. Ahab was married to Jezebel and Ahab ruled but it was their daughter who was the only queen that ruled in her own power. Sad thing though is that neither woman is “beautiful” in terms that we use as beautiful. I had a dream of the former president’s wife and daughter – which I have never dreamed before, and as I woke up wailing my first thoughts were: Here I’ve been watching “the man” when it was his “wife and daughter” that I should have been paying attention to! Such a wicked, evil pair those two were. I’ve also noticed a great deal of visual changes in the former 1st spouse. I’ve been thinking the same thing that she fits the bill for your prophetic dream. she would be very formidable. One issue that might prevent this is if the prophecies of the big one hitting CA come true as then there wouldn’t be enough of an electorate left there to carry her to the nomination! FEMA already has concentration camps. Closed Wal Marts have become comsentration camps. Do a search wal mart FEMA etc. I watched many of them this week. Left a real heaviness and grief, I relieved with worship. My Lord has told me to stop watching the YouTube videos. He has spoken piece to my spirit. When Harvey and Irma left such desolation and homelessness, I asked my Lord how many were taken to th FEMA camps. There is a video of that, I did not watch it. There are so many homeless people now in America due to hurricanes, fires and flooding. Even the homeless who live on the streets are disappearing. It is sad that our government elite want to eliminate the majority of Americans who are helpless and on government aid, i.e. nursing homes, group homes like my youngest son who is retarded lives in, ………………….. The day will come when they are not so overt in their efforts of American genoside. We must hold tight to His word, Psalm 23 is my go to for protection and provision. The old Walmart in my t child storageown was painted this summer. “Gonna be a climate controlled storage facility” they said, but there’s never been any activity. As I drive post it last week, I felt “FEMA camp”. Yesterday I thought, it could be cold storage, for bodies. Is there a high fence around it? I saw a video when the 2 in Texas were closed. Several white vans parked there also. The man who started W M was very involved with the internment camps of American Japanese during the war. The new yellow icon is the sun, a masonry statement. This woman is an evil, make no mistake about it. She has already caused plenty of havoc in California with her anti-christian stands on issues. I even find her name unusual, “Kamela”, that is a very strange name to give a woman. It is indeed sad, that these political women on the scene now resemble Jezebels more than Deborahs. It is a sad day indeed. If you think THAT’S beautiful … you may need a few of those pills advertised on fake news channels 24 / 7. I’m curious as to whether or not readers here have felt compelled one way or another to get the flu shot this year? Never have, never will, nor will my children ever. No parent should ever allow their children to get flu shots or any other vaccinations. Amen, I have read that rubbing a lemon on after a flu shot helps diffuse it’s effects. Sorry Becky, but no way. You can’t take a chance of drinking deadly poison and rubbing a lemon on it. Please don’t. Flu shots are deadly dangerous, so are most other vaccines. Maybe all, I don’t know. When asked about flu shots or others, I ALWAYS say no. I did have a tetanus shot earlier in the year because it needing stitches 4 a cut by a sharpened spoon. I never get them just for the simple fact the adjuvents cause swelling in the brain that can lead to numerous problems including inducing autism in children, dementia-like brain damage in older people and I believe that much of the arthritis is caused, or at least inflamed by, mercury, aluminum and other metals in these pharmakea. Never mind the fact it could be filled with literally ANYTHING and how would I know? These companies are protected from lawsuits if something goes wrong and is proven and much of their process to make the stuff can be hidden by saying its a ‘proprietary’ process. Factor Eight a drug for hemophiliacs that was sold back in the ’80s back Merck was tainted with HIV and infected tons of people. The old polio vaccine was contaminated with cancer viruses that came from the dead monkey tissue they used to cultivate the polio virus. Just recently the UN has been forced to admit that in both Africa and India the polio vaccines they were giving these poor teenage girls were causing STERILITY because they put a hormone released during the early stage of pregnancy in it and it tricked the body into having a spontaneous abortion and causing a miscarriage. The HPV vaccines have killed and sterilized hundreds of young girls in Mexico the last I heard where they start seizing and bleeding from the EYES AND MOUTH. Its absolutely horrifying to think what people are injecting into their bodies multiple times per year! Oh has anyone noticed in the doctor’s offices they not want PREGNANT women to take flu, pneumonia and other vaccines now?! Since when was THAT considered okay? Anything they promote is not going to be good. I have never gotten the flu shot. My kids don’t get them. My wife finally stopped getting them. Have not had the flu in years. My son went to ASU for his first year of college. Had to have a mandatory shot to get admitted. I protested but to no avail. He had a reaction to the shot and we got to spend the day and some of the night in the ER. So what was in this shot? Have no idea but he only went there for one year. I should have just left when they would not let him register without the shot. My understanding is that most of the immunizations contain Thimerosal. Look it up. Never. I had a revelation when they first came out that they are not what the government says they are. Any one wonder why the government pushes them so hard? I find it very curious that they have a different shot for older people this year. Why was Donald Trump elected? People are fed up and like what he said. At the very least, the two major political parties lines are blurred. Remember 2014 primaries when many democrats lost their seats giving complete power to congress and yet nothing in policy changed? why? because the far majority of politicians and supreme court justices serve the luciferian cause either by force or consent. Now, look at the recent election of Roy Moore. Again the people voted against the establishment and even against the endorsement of Trump and pence. This tells me and you that all patriotic Americans are fed up. Now, in as much as we are fed up, the globalist cabal is foaming at the mouth in rage and looking to take out the POTUS one way or the other. Now look at our history, when the establishment decides it is done with a president, what happens? JFK to name one ring an bells? Now, look at Ivanka Kushner and her hubby who doesn’t know if he is a male or female. Ivanka is sympathetic to liberal causes and Jered Kushner fits the transgender narrative. Now imagine that your choices are Kamala Harris or Ivanka, BTW who has been attending almost all high profile government meetings and learning the political trade. Which would be more likely to win and BTW, which one really defines beauty in this situation? Just my humble opinion. You’re right about Ivanka winning the beauty contest, but Obama’s statement that Kamala Harris will be president one day moved her to the top of my list because the woman I saw in my dream reported to Obama and was loyal to him. God put Trump in, and He will protect him. As Jesus walked away from those who wanted to kill Him, so, our President will be protected unless God lifts His hand of protection. Keep praying for him.